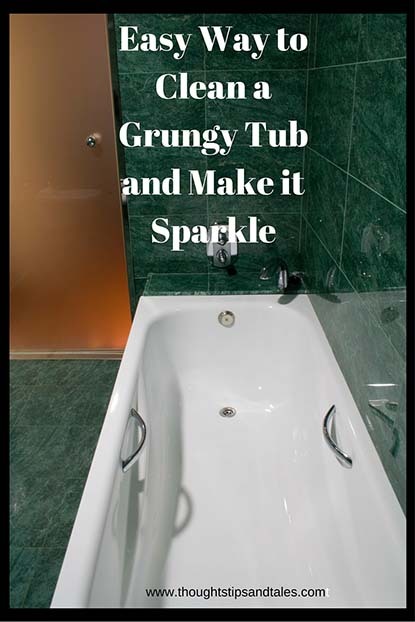 If you have a bathtub or two that looks grimy and dull, try this easy DIY solution to clean a grungy tub and make it sparkle! When I bought my house, it was two years old and the only turnoff was that the bathtub in the master bedroom didn’t look very clean. I scrubbed it with a variety of brushes and cleaning products over the years and nothing made much of a difference. Then I read this DIY “recipe” for tub cleaning on Pinterest and thought I’d give it a try. Had tried some other cleaning tips on Pinterest that were only mildly successful, but this one was amazing! Spray the mixture (which should turn thick and into sort of a gel that will still squirt) to coat the bottom and sides of the tub. Give it a try and let me know how it works. This may be the easiest cleaning project you ever do! This entry was posted in DIY cleaning, life, miscellaneous and tagged amazing tub cleaner, clean a dirty tub, clean a filthy tub, clean a grungy tub, DIY tub cleaner, how to clean a grungy tub, make your tub sparkle. Bookmark the permalink. I tried this tip once and yes, it works great! You gotta love Pinterest! Glad to know you had success, too! Everyday I have to use different cleaning techniques in my business. Using citrus fruits and vinegar is my favourite. I like this post, very helpful.